Hungarian Redwork Runner: The Chain Stitch is Finished! Believe it or not, the Hungarian Redwork Runner that I started eons ago hasn’t been neglected entirely, despite the comings and goings of many other embroidery projects on the work table. And while the progress on this particular project may seem particularly slow, I have good news to report: the chain stitch part of it is more or less completely finished. There are just a few tiny chain stitch bars remaining, that await their intersecting lines of Hungarian braided chain stitch. Here it is, so far. 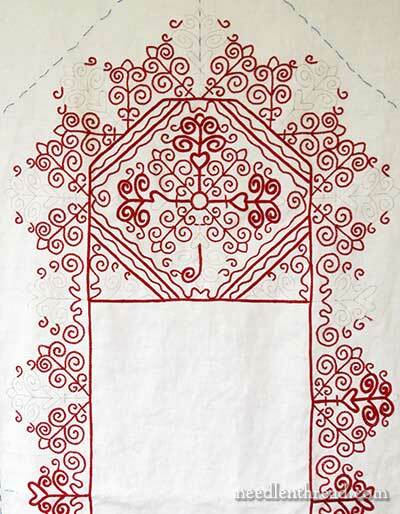 I started the runner back in 2012, when the idea for it evolved from this Hungarian embroidery pattern. I needed a “grab and go” project – a project that I could easily transport, that could be stitched anywhere, that used minimal supplies. From the original pattern, I worked up a few variations in the design, and chose this particular variation of the embroidery design for the project. Next up was the embroidery thread selection, which required testing a few threads and stitches together, and then the embroidery design transfer process onto white linen, and finally, the stitching. And that last part – the stitching – is taking a looooooooooong time! The runner also fit into my “15 Minutes” approach to certain types of embroidery projects. The runner project is ideal for my 15 Minute philosophy, actually. The whole point of 15 Minutes is just that: spend 15 minutes a day on your embroidery, somehow. Use it to relax, use it to make progress, use it to refocus. The advantage of 15 Minutes is that, if you can devote just 15 minutes a day (or when you can) to your embroidery, you will eventually notice significant progress. Snatching 15 minutes for embroidery in the morning before heading out to work, or on a lunch break, or mid-afternoon when other work is done and you need a short breather, or in the evening before going to bed, will help you make progress on that project that never seems to get your attention anymore. And of course, it doesn’t have to be 15 minutes. It might be longer. It might be less. But chipping away on a project in this manner does eventually pay off! Several people have asked about the center section of the runner – the Big White Rectangle. I designed the piece to go in the middle of a table, and that’s where I’d put a centerpiece, personally. Flowers, fruit bowl, candles, something like that. Hence, the blank rectangle in the middle. So, what’s left on the Hungarian runner? Some sections of the Hungarian braided chain stitch – and then the finishing! In the scheme of things, not much remains! But it will still be some time before I get to the point of finishing. It will surely happen this year… I hope! You can read more about the Hungarian Redwork Runner and see the progress of the piece, the materials involved, the design used, and all the nitty gritty details by visiting the Hungarian Redwork Runner project index, where are the articles relating to this project are listed chronologically. January 25, 2013 Hungarian Redwork Runner – End Finished! Wow! That is AMAAAAaaaaZinG! Looking GREAT, Mary! I love your 15 minute philosophy. It always keeps me inspired and moving forward – though sometimes I just bounce around from project to project.Though sometimes it means not finishing anything for a long while, and then finishing it all up around the same time. The important point is that it IS progress. Lovely work, Mrs. Corbet! I don’t have a time limit strategy, but I do have a section by section strategy. I find it really helps to look at a project as many tiny pieces that make up a whole. This is ironic because I loath jigsaw puzzles. I do have a question… What is the fastest project you’ve ever done? I just completed two pillow cases in less than two weeks. It’s the fastest I’ve ever gotten anything done. Thanks, Anita!! 🙂 It’s getting there…. Maybe the 15 minute philosophy will work for me. I have SO many unfinished projects that I feel really guilty. I have a hard time focusing and concentrating on one thing. It’s terrible. I always want to try new colors, etc. and then I end up with a bunch of unfinished stuff. I will have to adopt your 15 minute philosophy and see how it goes. Nice progress, Mary! Love the picture of the whole thing. I was thinking about this embroidery yesterday. I am so glad you shared this update. I have taken on our 15 minute philosophy and started to carry my stitching project with me when I have to wait at the doctor’s office or the car service center. I am pleasantly surprised how many people just come over to look admire my work. One of these days, my cross stitch will get finished, as you said other projects seem to get in the way. I like it, Mary, I hope that you do finish it and use it. Did you double chain some of it? I see a few areas look a bit thicker as does the inner border. Also, what is going around the outside edge? Will it be hemstitched or embroidered? Please take a pic with a fruitbowl or flowers in the middle. Thanks for posting this. It’s Hungarian braided chain in the thick spots, Laura. The outside edge is yet to be determined. It depends on how I cut it. I have a couple different ideas floating around…. G’day and H’ray Mary for this wonderful creation. It’s worth every single stitch, it looks fabulous. Good on you! Real Progress! Yes, it suddenly looks Nearly Finished – and you’ll find those little stitching sessions begin to eat up the remaining marked lines very quickly now, as they did at the start. The Boring Bit in the Middle is the hard part to get through, when small increases are less obvious, and you’re well past that now. Onward! What kind of edge treatment are you planning, Mary? A plain hem or something more ambitious? Haven’t decided yet, Sue…it depends on how I cut it. I’ve got a couple ideas in mind, including something red and traditional Hungarian-looking. We shall see! That’s funny you made this post today. I was just wondering if you ever finished it last night. I really want to do this one but hesitate because of how long it took you. I realize it wasn’t your main project as it would be for me but still seems very intricate and involved. Please be kind enough to advise approx. how many skeins of #25 did you use and what colour?, with Hedgehogs having a sale, I would like to order enough to complete the project as you cannot get this thread in Sydney and postage is always so expensive. Thank you again, your generosity knows no bounds,stay BLESSED. I used just around 6 skeins – so I’d say order 7, to be on the safe side! That’s so pretty! What are the blue lines for? Are they a type of grid? The redwork runner is beautiful. SO glad to see your project coming along. It doesn’t seem like it was 2 years ago that you first started talking about it. I look forward to seeing the finished project soon! It sure doesn’t seem like it’s been 2+ years since you started. It is lovely. I’m looking forward to how you will finish it. Quick question–when will your monogram letter book be published and available for ordering.? I remember reading you were working on it. I have subscribed to the 15 minute idea for quite some time, particularly for pieces that are not going well. It’s great for breaking through a wall and it’s surprising how often a dreaded 15 minute session ends up turning into several hours. Hi Mary. This is my kinda post. With this mindset on crafting, my time is relaxing when I stitch (unless it’s picking out @#! ), I don’t have to wait until retirement to start projects, and there is no pressure for a time frame. Hope you are enjoying the weekend. What a lovely runner! I am happy to see you promoting the 15 minutes of stitching a day! I have been working on this for years now and it really works! Previous Previous post: Monograms – A Book Give-Away!